The extremely hot weather is still with us. From Thursday on we should have a change with cooler weather, rain and storms coming in. We had the hottest May here since they recorded the weather, and June and July were almost at the top of their leagues, so hope the rest of this month might be a bit more normal. But first we need to get through the next three days of BIG Sahara heat! At Tag Tuesday our theme is still Bingo, and you have a week to join us. This is also my drinks picture for Elizabeth's T stands for Tuesday, so here a hearty welcome to all of the lovely ladies of the T Gang. I am linking to Simon Monday Challenge, tape it up. We had another great outing yesterday, but I will show the photos next week. ....Hope summer soon arrives for you! I'm looking forward to Autumn! Your lady is beautiful. I loved the sentiment and it was such a thought provoking quote. That bingo tag was lovely, but the way you also shared it as a T Tuesday entry is brilliant. I still have trouble believing that is digital. It is fabulous and has such great detail. Thank you for sharing it with us for T this week. The photos from the theater play were fabulous. How wonderful to see it come to life through your photos. And the audience appears to have been huge, too. What lovely diversion to take your mind off the heat. Very cool tag. though I'll break for a cup of tea, please. I like the quote of your ginger lady with the mesmerizing green eyes. The walk in the woods looks so lovely and cool. How fun for the children and children at heart to see live theater in an outdoor setting. Magical. Stay cool! Lovely tag and mixed media page, interesting materials. Glad you escaped the heat somewhat in the woods, the open air theatre was a great find! Stunning photos, the ducks are beautiful. Beautiful artwork Valerie and lovely photos too. Hope you can keep cool until the storms and better cooling weather arrive and thinking of you. Still very warm hear though thankfully nowhere near the temperatures you have in Germany. Great job on your bingo piece. I love the quote with the other piece. I believe pencils can take us anywhere. When I spend time drawing I am so happy and content. I also spent time in the woods this past weekend. There is a heatwave here right now- and the woods were cooler. Your pictures look lovely. I hope it wasn't too hot for the actors in the play. I always loved Pippi. :) Looks like a fun show. Thanks for sharing. So many Good Things today. Loved your perky girls. And pencil and a dream....purrfect. That outdoor play looked like all sorts of fun. great trip you had and fun with pippi i know her well here in denmark and living close to sweden. ein schönes mädchen hast du gemalt,sehr schöne bilder aus dem schönen bunten wald,pippi sieht ja klasse aus,sowas wäre auch mal was für mich.
Stimmt, wir sind nie zu gross fuer Pippi. Valerie your postings always bring happiness...thank you!!! The journal page with the beautiful lady is fantastic and I love the words you added. The bingo tag looked fun as well I loved the images you used. Super photos from your walk in the wood. The theater in the open air looks an amazing place to visit. It seemed to have a good audience which is heart warming for the actors for them to see how they are appreciated. Happy T day wishes for Tuesday. They say that we will be getting some cooler weather later in the week, I hope you do too. Ohh I am the BINGO queen. My neighbor just asked me to join her for BINGO. Can't wait. So I really love this piece. Looks like a fun place to go in your photos. Love the bingo tag, love your photo's too. I'm certainly not enjoying the continued heat we too are having here in the UK … hoping for cooler weather soon! Your Bingo tag is adorable, Valerie. I love the girl leaning on the cafe table. It looks like a die cut, but maybe you did it digitally. So clever. I also love your red-haired lady and the quote you used. That could apply to writing as well as art. That's a cool (double entendre intended) open-air theatre. Fabulous set and props - down to the spotted horse. I was surprised at the size of the cake, as well as the crowd. Love that beauty on your bingo tag! And your red haired lady is so unique. A beautiful drawing. What a fun visit to the theater. I love all the interesting props, especially that horse. Sure hoping you get that cool down. A fabulous tag and I love the lady with the gorgeous hair, it looks like you had a wonderful day out, I don’t know Pippi Longstocking, I’ll have to look her up. Have a lovely day. 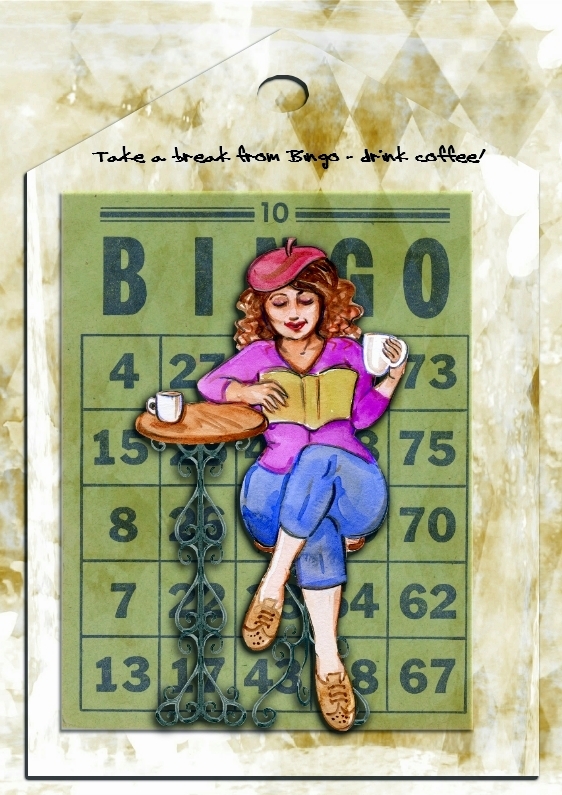 Terrific and relaxed way to play Bingo--a great tag for sure Valerie. I wish I was brave enough to have my hair that coplour it looks amazing on the great face. Wonderful place you found to visit anf sucha bonus for theri to be a play there as well. Just the sort of place I would love to find. Wonderful post and I love all the photos. Thank you for taking me to the woods. I feel cooler already. It is sooo hot here. Pepi Longstocking is timeless and I am glad the children still love her. The scenes look great. So imaginative and colorful. Your Bingo tag is lovely. It is not an easy subject but you did good. Your ‘red’ lady is beautiful and of course the quote is so true. always enjoy your beautiful photos! was your red-headed lady on your journal page inspired by Pipi Longstocking?! She looks quite sassy, very lovely page! the Bingo card is quite adorable too! happy T day! Perhaps she's Pippi grown up!? Love the tag and face on the journal page. The open air play looked like it was really fun! Spots on the horse cracked me up. Hoping you get some rain and cool weather soon. I would have loved to see the open air theater play. It really looks fun. The house are as colorful as the pianos at the Art Park, that I photographed! Great journal and tag! Thank you for sharing this wonderful post! Love the Bingo tag Valerie, it's a great image. Loved seeing the photos of the park with it's open air theatre and I hope your walk in park was nice and cool. Our weather's changing from Thursday too, we've got rain in the forecast. Ha! I'm sure you definitely know where to find crafty goodies! Great image for the bingo card and I LOVE the redhead! And oh, that little yellow "house" is adorable! That Pippi Longstocking stage was SO cute!!! Ach die relaxte Dame mit Buch und Kaffeetasse auf dem Bingofeld mag ich sehr. Aber auch die rothaarige und grünäugige Schöne sieht total klasse aus. Wär was für ein Plakat. Diese lustige Pippi-Langstrumpf-Aufführung hätte ich auch gerne gesehen, schöne Fotos hast du davon gemacht. Die Riesentorte auf dem Schiff und das getupfte Pferd sind lustig. I pray for cooler weather for you! We have been getting tones of rain, but it's still so muggy! I have been gardening so much!!! Everything is growing like crazy! LOL! Love both your art pieces! Your bingo card is adorable and I love your lady face! Gorgeous area where you went to cool off! Love the horse! LOL! What fun your bingo lady is!! And that redhead-there is something about her, I don't know, but I so love her! Maybe it is her eyes or the way you have positioned her head- she is beautiful! Your tag is lovely and I so much love your redhead, she is gorgeous! What fun that open air theater seems to be. Beautiful post, Valerie - your girls are just so much fun and relaxed both on the tag and in the journal. Great art work!